Water Color PAINTING SUPPLIES: a complete, all-inclusive art set that lets you instantly create a water color painting when you open the box. 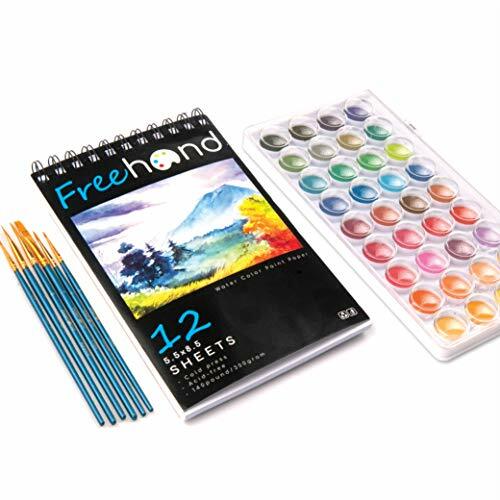 Includes a 12 page Water Color Painting Pad, a set of 36 water color painting cakes, and a selection of 6 water color paint brushes in assorted durable sizes. 36 VIBRANT COLORS: allows you a range of colors, hues and tones to bring your artistic visions to life. Art kit contains 36 water color cakes including the indispensable primary colors along with earth tones, shades of blues and greens and skin tone hues to paint everything from portraits to landscapes. 6 PAINT BRUSH SET: create every stroke of your masterpiece with a selection of 6 finely crafted professional paint brush set. Included in the collection of 6 professional artist brushes are nylon brushes in a variety of handle styles and shapes for complete mastery of technique and application. The brushes in this paint set were specially selected to include brushes for applications from wide strokes to fine detail water color paint applications. PERFECT GIFT IDEA: let your artistic side creatively flow as soon as you open the painting supplies box. Everything you need to create a water color painting is included in this remarkably priced complete paint kit for the beginner, hobbyists or professional artist. QUALITY GUARANTEE - Free Hand Art Supplies represents superior quality and customer service with your highest satisfaction or a money back guarantee. We are confident you will enjoy this paint set. We specialize in art supplies for artists. Excellent choice of water coloring set!